Welcome to Critic's Notebook, a quick and off-the-cuff car review consisting of impressions, jottings, and marginalia regarding whatever The Drive writers happen to be driving. Today's edition: the 2019 Nissan Titan Platinum Reserve. Powertrain: 5.6-liter V-8 engine; 390 horsepower, 394 pound-feet of torque; seven-speed automatic transmission; four-wheel-drive. Quick Take: The Nissan Titan is solid, comfortable—and outmatched by the competition. They call it divergent evolution. Take a single population, cleave it in two, and isolate each half in a unique environment. After a while—500,000 years is a good start—the accumulated adaptations give rise to different species. Darwin saw it in his finches. In the automotive world, however, we see it in trucks. I'd argue that no other form takes on such vast differences across borders than the humble pickup, its inner workhorse manifesting differently depending on what the country at hand requires. Car-based utes by Ford and Holden rule Australia's Outback, the Kei truck is king in space-challenged Japan, hardened vets like the Toyota Hilux run the Middle East and Africa—and here in wide-open, big-bellied America, the full-size pickup reigns supreme. Just as we look askance at truck offerings abroad, so too does the rest of the world when they gaze upon the street-legal monster trucks owned by a growing number of Americans. But the reasons why full-size trucks sprouted here (or why they're grown so damn big) don't matter for our discussion. What matters is that we like 'em large—and what that means for automakers who want a piece of the half-ton pie. 15 years and (somehow) only two generations in, the 2019 Nissan Titan stands as the Japanese marque's latest attempt to crack the domestic market and grab some full-size truck buyers from Ram, Ford, and General Motors. The task is monumental. Segment leader Ford sold 18 times as many F-Series pickups as Nissan did Titans last year; even third-place Ram managed 10 times Nissan's 50,000 sales. Today's pickups have to be true all-rounders, equally at home hauling a boat, a bed of mulch, or a backseat full of children on a road trip. It's a world of fierce loyalties, of spec-sheet battles, of ever-growing expectations. And a week with the 2019 Nissan Titan Platinum Reserve shows this truck is surviving—but it's definitely not thriving. 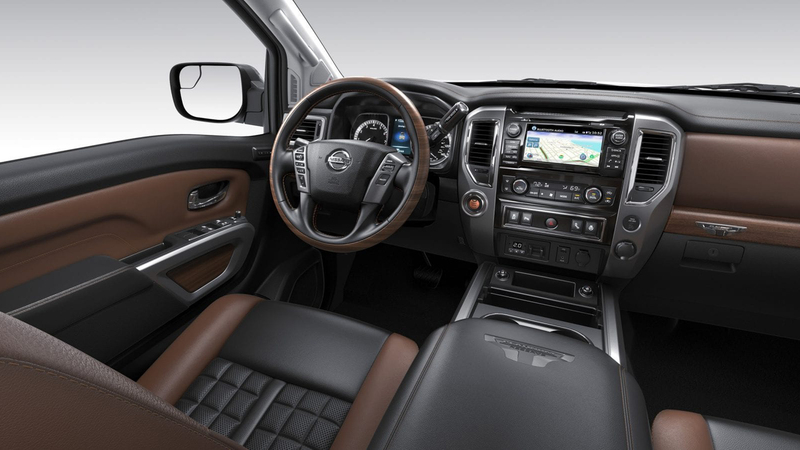 The Platinum Reserve is the most expensive Nissan Titan you can buy; as such, its cabin is replete with features like supple "Zero Gravity" leather seats, a kicking 12-speaker premium Fender sound system, and pleasing wood accents. (I even like the one on the steering wheel). 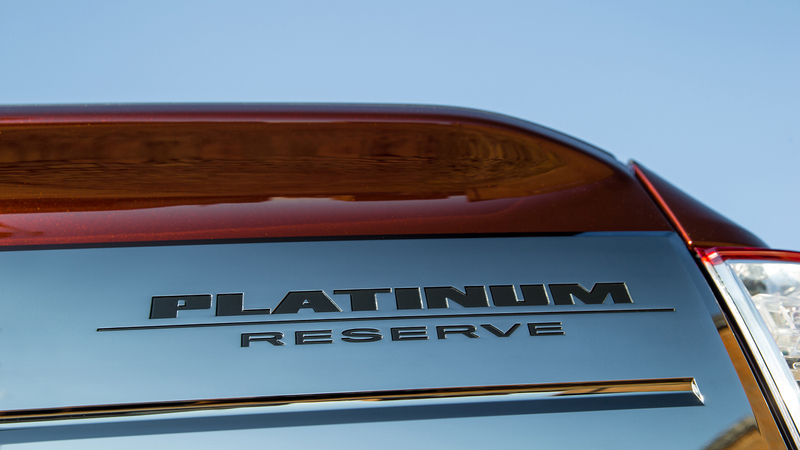 The brown-and-black color scheme on the Platinum Reserve classes up the dash and trim panels' basic design. It's a truly comfortable place to pass the miles. It's commendable that Nissan still offers a standard 390-horsepower V-8 on all Titans, which gives the truck plenty of around-town power, a strong bite, and that pleasing eight-cylinder thrum. The higher-trim trucks demand it, true, but the Titan's engine has more power and torque than the Chevrolet Silverado High Country's standard 5.3-liter V-8. It's smooth and punchy, the Sugar Ray Leonard of full-size pickup engines. All too often, reviewers to grab a pickup and do absolutely nothing to test its true abilities as a truck; I admit I didn't tow anything or fill its bed with yard waste. What I did do was use the truck to explore the Woolsey Fire burn area in the Malibu mountains while reporting this story on the famed Rock Store. The roads were still dodgy then—buckled in places, covered in an ashy, muddy sluice in others. The Titan ate it up. Most any full-size pickup would have, really, but the Titan's more conservative nature felt right at home when the going got moderately rough. The integrated tie-down system and side-mounted cargo boxes in the bed are great solutions for managing oddly-sized loads. The Titan and I, we'll always have Malibu. Unfortunately, down in the less-apocalyptic real world, the Platinum Reserve ranks dead last in towing and payload capacities for full-size V-8 trucks. It's true that the average truck buyer will rarely be called upon to tow more than 9,230 pounds. It's equally true that this is one segment where numbers absolutely matter. Sales don't lie. With that in mind, it's worth calling out the weird packaging Nissan has inflicted on the Titan. Despite the fact that it's made here in America, Nissan apparently doesn't have the flexibility to offer different bed sizes with different cabs. 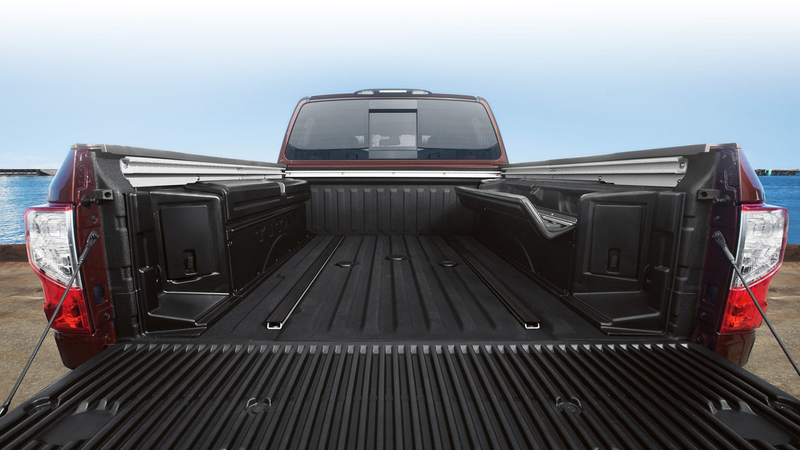 Single cabs get the 8.2-foot bed, King cabs get the 6.5-foot bed, and the four-door truck has a 5.5-foot bed. There are also no powertrain options—no larger V-8, no better transmission, and no diesel unless you upgrade to the sorta-heavy-duty Titan XD. Also, for the makers of the Leaf to not offer some sort of electric assist to rival Ram's eTorque trick seems like an obvious miss. Though comfortable, the interior falls well short of its $60,000 aspirations. 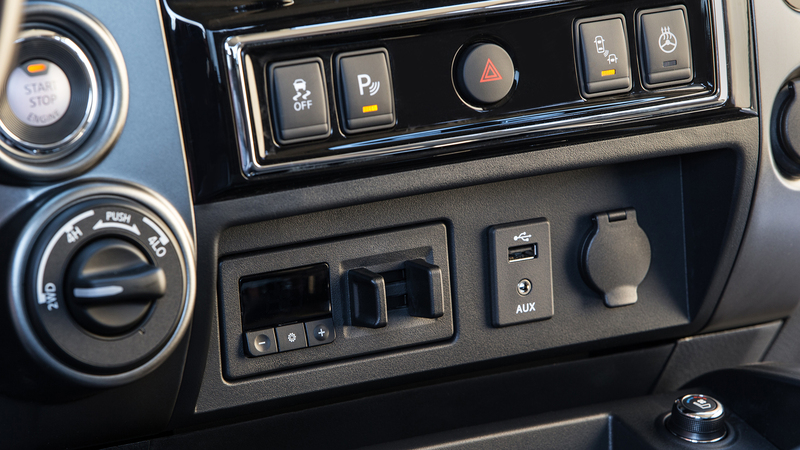 Those wood accents have more of a louche '80s lounge charm than anything else—I like them, but they're certainly not tricking me into thinking I've got a genuinely high-end vehicle on my hands. Similar to the new Silverado, it doesn't differentiate itself enough from the base model to make it worth the price. A bigger problem is the 7.0-inch touchscreen, suffering from an uninspired center-stack design that leaves it looking small and crowded. With the rear three-fourths of pickup design scrawled in stone, the front end makes all the difference. Nissan's looks best in the Platinum Reserve's chrome dressing, but overall the Titan's fascia is an awkward concession to size. The swooping angles don't work; neither do the human head-sized headlights. The front end also looks oddly nose-forward from certain angles. The biggest problem overall is at once simple and intractable: There is no compelling reason to buy a Nissan Titan Platinum Reserve. Ram, Chevy, and Ford trucks all have the benefit of decades of experience and growth here in America. Generations have watched them do the work of the country, and today those companies draw upon and trade on that reputation. Those trucks exist because we literally needed them to; meanwhile, the Titan exists because Nissan thought it could capitalize on American tastes. There's nothing inherently wrong with that premise. But the result needs to feel like more than a checklist, and the Titan doesn't bring anything special to the table. 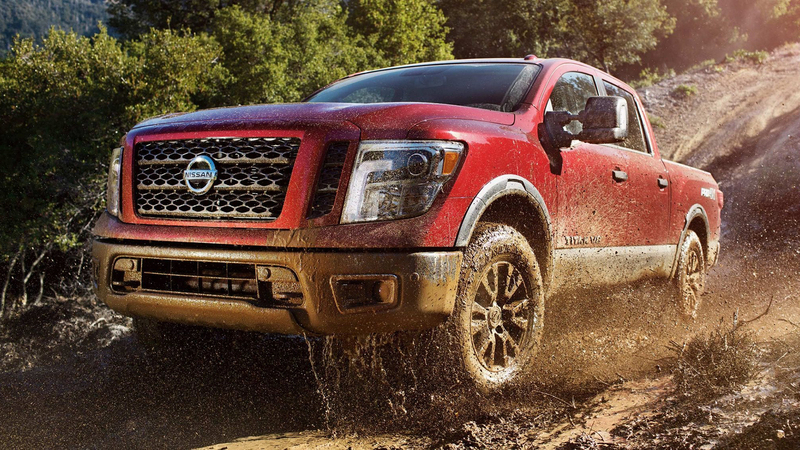 The real value of the Nissan Titan is what it offers in lower trims compared to its stateside competition. The Titan delivers a standard V-8 on every trim level, something only the Toyota Tundra can also boast—but the Tundra starts around $4,000 more, and doesn't offer a true single-cab model like the Titan. The base model Nissan Titan is a proper work truck, the likes of which aren't really made anymore. And even though it doesn't win the numbers game overall, the lower-mid range delivers solid bang-for-your-buck: A well-equipped Titan Crew Cab SV with dual-zone climate control, automatic wipers, and rear cross traffic alert will run you around $42,000 out the door—more than $1,000 less than a comparable Ford F-150 XLT with a V-8. But a $60,000 pickup truck demands much greater scrutiny, under which the Nissan Titan Platinum Reserve loses its luster. 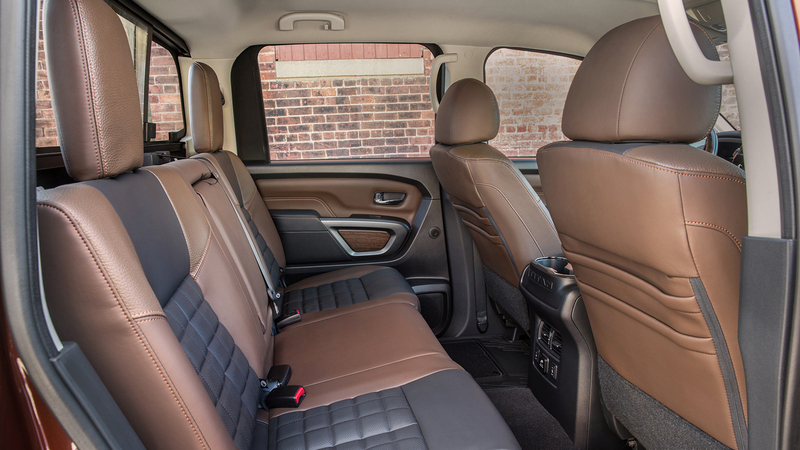 You could get a fully-loaded 2019 Ram 1500 Limited for that money and enjoy life in the most genuinely luxurious pickup interior on sale today. Seriously, look at the options on a $58,000 Ram. Ventilated rear seats. Adaptive stop-and-go cruise control. A 19-speaker Harman Kardon sound system. That 12.0-inch touchscreen. Air suspension. None of these things are available on the Titan Platinum Reserve. Simply put, the most luxurious pickup Nissan makes is a terrible value. The pace of change is quickening; the expectations, rising. Since the new Nissan Titan launched in 2015 (on a platform that dates back even farther), both Ram and General Motors pulled the wraps off the next generations of their respective full-size pickups. A new F-150 is due in the next couple years. All promise bells and whistles you can't get on the Nissan, with powertrain combos you can't get on the Nissan, delivering tow ratings or fuel economy you can't get on the Nissan. The American market has its demands, and with over a half-century of experience here, the legacy truck makers have the flexibility to meet them. The Titan looks, feels, and is dated; particularly troubling is the fact that its first generation hung on for a good 12 years, from 2003 to 2015. Even if that lifespan was artificially extended by the 2008 financial crisis, Nissan's got a track record of keeping models going long after their sell-by dates. Such commitment is usually laudable; in the Titan's case, in the face of ever-more-advanced competition, it might be fatal. 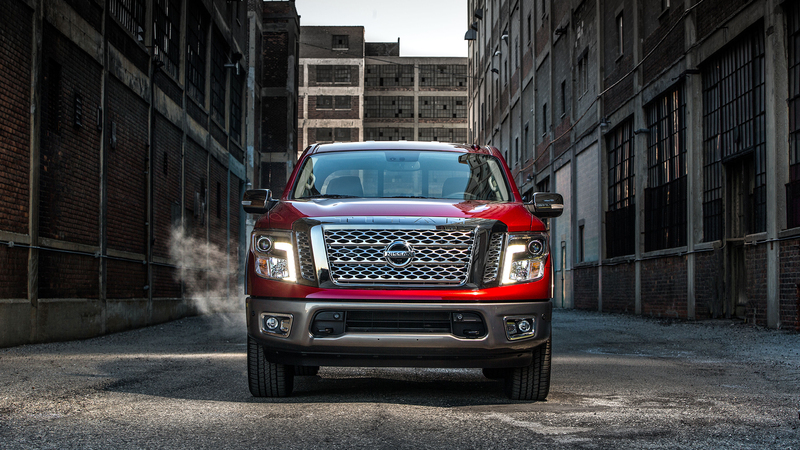 You get the feeling something was lost in translation with the 2019 Nissan Titan Platinum Reserve. The gist of the message—big, capable truck with a V-8—is there. But the details are all off.